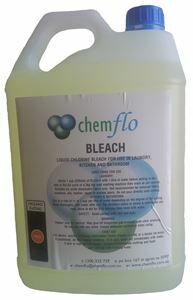 Chemflo Bleach is a liquid chlorinated bleach. Chlorine is a very powerful bleach capable of removing many stubborn stains. in the kitchen fordestaining tea and coffee cups, chopping boards, etc. Bleach is a powerful disinfectant as well as a bleaching agent.